Posted by Martin Koser on 20. January 2008; This entry is filed under Business Models et al., English posts, Innovation et al., Media Industry, Strategic Thinking. Well, yes, here’s some more stuff on innovative business models in the media industry. I enjoyed Piracy, Morals and The Need for Change and The Generational Divide in Copyright Morality by David Pogue in the NYT. 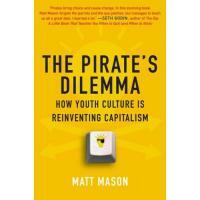 It’s all about Matt Masons new book, “The Pirate’s Dilemma: How Youth Culture is Reinventing Capitalism”, where Matt argues for piracy as a business model rather than a threat. In a podcast with BusinessWeek he discusses the history of piracy – and how it drives innovation, get the mp3, alas it’s a low audio quality phone interview. A teenager hacked into the outfit charged with protecting companies like Sony, Universal, and Activision from online piracy—the most daring exploit yet in the escalating war between fans and corporate giants. Guess which side is winning.